Corbyn Vs Cameron : What’s Worse? Promoting peace talks to save lives? Or knowingly arming people who are killing civilians including children? Prime Minister David Cameron is making a habit every few months of accusing Labour party leader Jeremy Corbyn of being a “terrorist sympathiser” for having (unwisely in my view) referred to some Hamas and Hezbollah representatives as “our friends in Hamas and Hezbollah” (1) – (2). This is pretty rich stuff, especially considering what David Cameron himself has done in continuing to actually arm people who are killing civilians. Even Efraim Halevy, the former head of Mossad, has been calling for the Israeli government to accept Hamas’ offers of talks on a long-term peace deal for some 8 years now (3) – (4). So suggesting talks with Hamas is not an endorsement of everything Hamas has done, nor beyond the pale. Corbyn is similarly trying to bring about peace between the entire elected Israeli and Palestinian governments – which includes Hamas, who won the last Palestinian legislative elections in 2006. You don’t do that by disowning your contacts (5). David Cameron meanwhile is approving arms sales to governments and militaries involved in killing civilians, including children, in war crimes, on a large scale. These include the governments of Israel, Egypt, Saudi Arabia and Bahrain among others. While Hamas’ armed wing have certainly been involved in terrorist attacks targeting civilians in some cases and making no attempt to avoid killing them in others, Israel’s military have done the same over and over again to Palestinian and Lebanese civilians, and, since they are much better armed, killed far more. 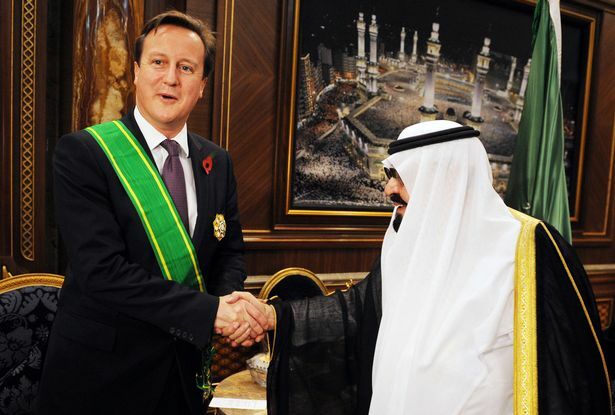 Cameron has been not only approving arms sales to the dictatorships of Egypt, Saudi and Bahrain but actively promoting them . 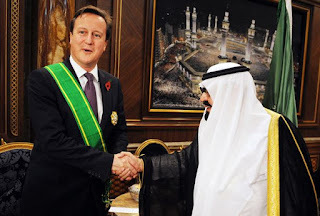 At the height of the Arab Spring protests when Mubarak’s forces, the Saudis’ and those of the Bahrain monarchy were jailing, torturing and killing democracy protesters, Cameron brought a delegation of arms salesmen with him on his tour of this countries (6). The Saudis have been bombing schools and hospitals in the civil war in Yemen, in attacks described as war crimes by Amnesty International (7). Months after Amnesty’s report on this, Cameron was still describing the latest arms deal he had negotiated with the Saudi monarchy as “brilliant” (8). This is the man with the gall to criticise Jeremy Corbyn for refusing to torpedo the chances of peace between Israelis and Palestinians by disowning Hamas. David Cameron, a man happy to not only call war criminals and murdering dictators his friends, but not only approve, but actively promote and negotiate arms deals with them. Jeremy Corbyn meanwhile only tries to get Hamas and Hezbollah involved in peace talks to end the killing. Many politicians have been claiming that they are refusing refugees asylum and sending them back to Turkey in order to “discourage others from making the dangerous journey” to the EU. There are a few problems with that story. First Turkey is not a safe country for refugees in any sense. Turkey has been deporting Syrian refugees back to Syria since January , including many children (1) – (2). On top of that Turkish border guards have actually begun shooting Syrian refugees as they try to cross the border (3). And since the middle of last year there has also been civil war in Turkey itself, between the Turkish government and military and Kurdish separatist groups. There was a peace process between the two and negotiations were close to a breakthrough. Then left-wing Kurdish pro-peace HDP party won enough seats in an election to take away President Erdogan’s AKP party’s majority in parliament (4) – (5). At the same time in Syria, Syrian Kurdish groups with the support of the PKK (a Turkish Kurdish separatist group) took territory in Syria, on the border with Turkey. This raised Turkish fears of a Kurdish state (6). Erdogan responded by restarting the war with the PKK and other Kurdish separatists in Turkey. 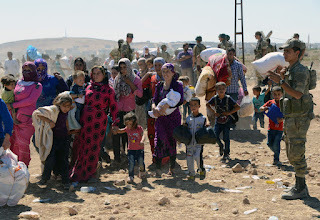 Kurdish civilians in Turkey are among the casualties of Turkish military sniper fire and there is some evidence of war crimes against Kurdish civilians (7) – (8). This means Turkish Kurds aren’t even safe, let alone Syrian Kurdish refugees. What’s more there has been no food for many of the Syrian refugees in camps in Turkey, Jordan and Lebanon since the middle of last year, when the UN was forced to cut off food aid to many of them due to lack of funds. Wealthier governments simply haven’t donated enough money to buy that food (9). Nor is Turkey even a proper democracy for people born there – journalists and even opposition MPs who criticise the government are often jailed. Insulting the President is a criminal offence with a sentence of 4 years or more in jail. So refugees can forget about having any rights at all (10) – (11). Libya is even more dangerous, with the many sided civil war still going on. Why aren’t The Muslim / Arab countries Taking Their Share? The EU and the UK should take more. And as long as both are sending refugees, including children, back to Turkey, pretending it’s a “safe country”, it is impossible to be proud to be either British or European. True, David Cameron did do a partial u-turn on his government’s refusal to allow any unaccompanied child refugees from Calais to be granted asylum in the UK. But this only allows children who arrived before 20th March to apply for refugee status – and there is no guarantee of any who reach their 18th birthday soon being allowed to stay after that (13). Why are they coming here illegally? As for the outrage over migrants and refugees “coming here illegally” what choice are they given? The vast majority of them have none. Other than the pitiful number of 4,000 a year being selected by the UK from refugee camps in Turkey, out of millions of Syrian refugees, to one of the richest and largest countries in the EU, they have to the EU or UK illegally to make an asylum claim (14) – (15). The obvious alternative would be for governments like the UK’s to tell their embassies in Turkey, Jordan and Lebanon (and also countries bordering Libya, like Tunisia) to accept applications for asylum from people in those countries. Those whose claims were judged genuine would be granted refugee status and helped to travel safely to the UK, meaning they wouldn’t have to make dangerous journeys, pay people smugglers who are often violent criminals, or do anything illegal.